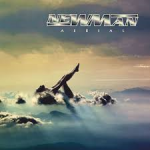 Share the post "Album review: NEWMAN – Aerial"
Album number eleven by Newman, the band formed around Steve Newman. Once again he has teamed up with drummer Rob McEwen (who has played on the last nine Newman albums), plus the album also features long time friend Mark Thompson-Smith on vocals on ‘Fear Of Flying’ and ‘Two Sides’. The album’s mastering was taken care of by none other than Harem Scarem’s Harry Hess. Busy time for Steve Newman as he is also part of the revamped Burn line-up who have a new album in November, but before that we have this new Newman album to enjoy and enjoy it you will! With a Newman album you can guarantee good, catchy melodic rock and on this album he has a couple of the best tunes he has done to date. Namely the superb ‘Fear Of Flying’ which gets the album off to a great start and ‘High Tonight (Aerial)’, that almost delves into a little prog a la It Bites with the mid-section keys solo giving way to a stonking guitar solo. ‘You Don’t Know Me’ is one of those uptempo, feel good tunes Newman does so well, and along with ‘Always Strangers’, would sound good in the live environment. This entry was posted in ALBUM REVIEWS, ALBUM REVIEWS (Mobile), All Posts and tagged Aerial, album, AOR Heaven, hard rock, Harem Scarem, Harry Hess, Mark Thompson-Smith, melodic rock, NEWMAN, review, rock, Steve Newman. Bookmark the permalink.